For those of you who took an interest-- here's the before and afters of my kitchen overhaul! 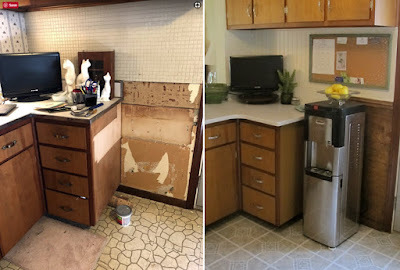 Sink Wall Before and After, click to enlarge! The old counter tops had a sort of chrome liner, they were a beast to rip out. (So says, the Home Depot guy.) But the cabinets below held up pretty good! They were able to fit the back splash part around existing electric outlets. 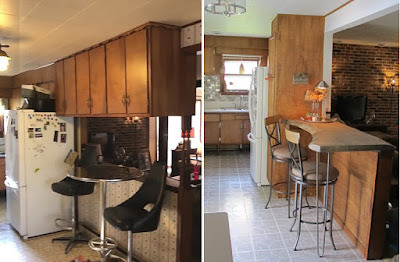 Kitchen Corner Before and After, click to enlarge! I had considered wallpaper for this area... But ended up using luan across the bottom and beadboard on top. 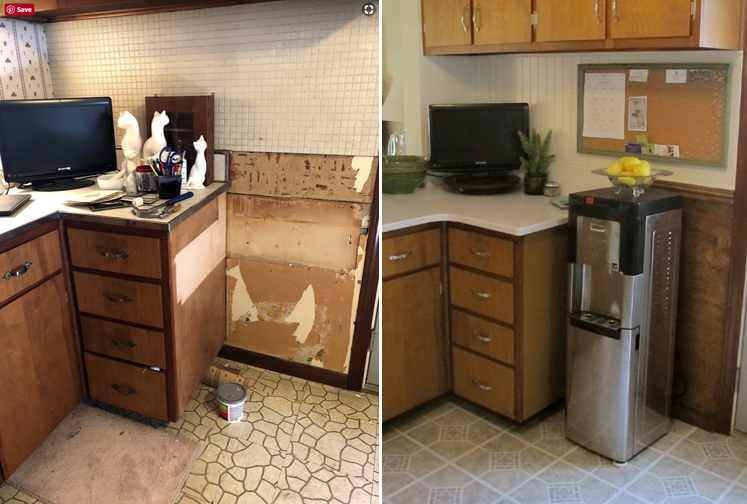 Since I started blogging about my kitchen overhaul, we have gone through three water dispensers! The first two broke and had to be returned or replaced. The water to the house is well water, so we don't drink it. (and my hair is turning (more?!) orange from showering in it?! but I digress) The current dispenser is a Whirlpool and so far, so good! Wall facing Living Room Before and After, click to enlarge! 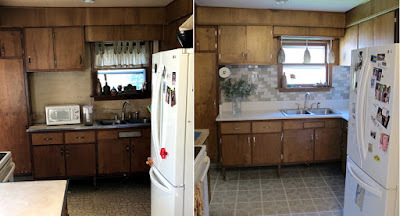 cabinets were removed and replaced with a tall cabinet next to the fridge... The cabinet was then sided and topped with luan to make it look built in. I wanted something organic to balance the geometry of the cabinets and tiles. We are fortunate to live near 3 Barn Doors, a company that does custom live edge wood... We went to their showroom and picked out a piece of kiln dried maple- which they cut, sanded and stained to match. The space feels SO much more open now! Sharing this project with you, dear reader made it a lot more fun and I think it spurred me on to get it done! Thanks for your interest and encouragement along the way. Happy Halloween, stay safe! Your kitchen looks beautiful!! Love that live edge countertop! Looks great Diane!! What a difference....I love live edge wood too!! The redo looks amazing. I love it when people rip out those crazy cabinets ones sees in that era's kitchens that entomb the cooking area! I suppose they were meant to be pass thoughs? Yet I see chairs in the before photo. It's infinitely better, yet is in keeping with the house. Bravo! 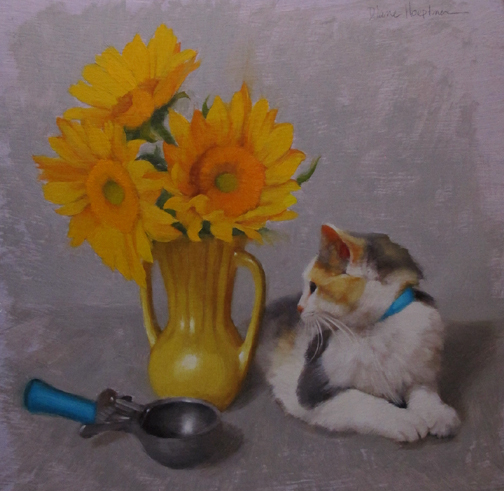 Also love the kitten in the painting! Thank you, Anne! "Entomb" is such a good word for that! It was very awkward! Husband claimed the cabinets for the garage and they totally work in there... :) Also removed early, scalloped wood trim throughout!?) Once I got those out, it was easier to figure out how to fill the space in a way that made sense. I had wanted a dishwasher-- but they don't do so great with well water... live and learn. Dishwasher installation would have busted the budget anyway. :) Thanks again. I think your kitchen looks fab (as does your painting). It's nice to see how you didn't get rid of your old cabinets, and have ended up with something very personal and not something everyone else has. I hope you enjoy your kitchen for many years to come!